About a month ago, a few enterprising young San Francisco foodies orchestrated a bagel pop-up. The duo imported a bunch of bagels from New York’s Russ & Daughters, serving them to the bagel-starved hipster masses in the Mission. The line was painfully long and wet, leaving hopeful bagel eaters in the cold drizzle for up to two hours. Far before everyone reached the front, the bagels sold out. While the event may or may not have been a success, it is clear that the denizens of San Francisco are jonesing for a good bagel or three. Yet there’s a far less annoying way to get them on your brunch table than braving a line: make them yourself. 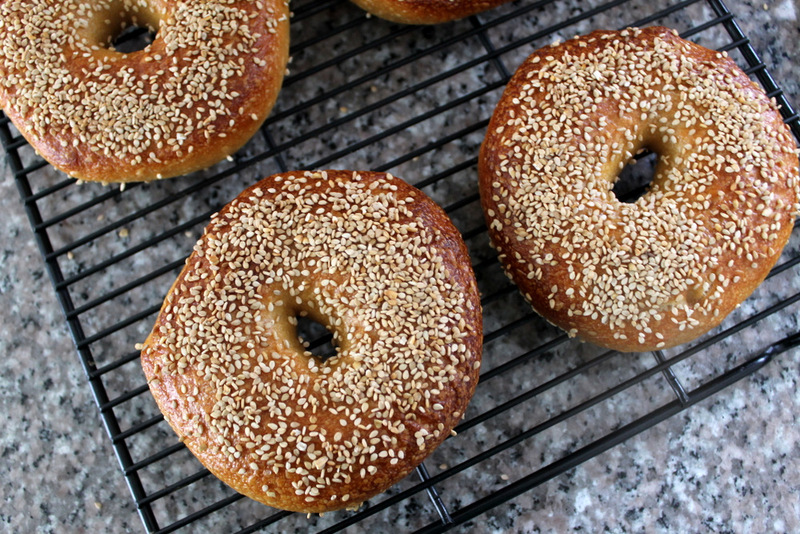 Baking your own bagels isn’t particularly difficult, but it does require time. Plan on starting the dough the afternoon before you’d like to eat them. When I’m baking any kind of bread, I use a stand mixer to knead the dough. Not only is it easier, but it also allows me to better control the amount of flour going into the dough. That said, you could absolutely knead this dough by hand (see the recipe below for instructions). I use a kitchen scale to measure the ingredients for the dough, using the gram setting on the scale. If you don’t own a scale, you should seriously consider buying one—it’ll make all of your baking projects easier and more accurate. I’ve scaled this recipe to use 1 pound or 455 grams of bread flour, which I measure directly into my mixer bowl. Bread flour has a higher protein check, so it will form more gluten and will therefore give the bagels serious chew. If you’re planning ahead, you can also look for high-gluten flour, which has an even higher protein content to use. 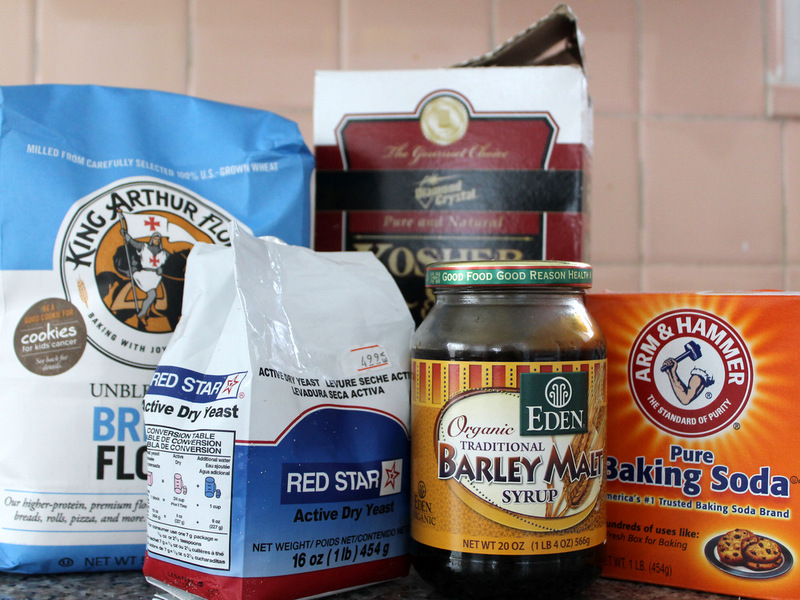 It’s the preferred bagel flour for bakers like Peter Reinhart. For sweetness, I add barley malt syrup, but you can also use honey if that’s what you’ve got on hand. Finally, I add a small amount of yeast. Since the dough will have an extended cold proof in the fridge, it doesn’t need very much yeast. Once everything is measured, I place the bowl in the stand mixer fitted with the dough hook and knead the dough on low speed until all of the flour is incorporated. Then I let this shaggy dough rest for 10 to 15 minutes. This period of rest is called the autolyse method and it allows the flour to hydrate and relax for easier kneading. I leave out the salt during the autolyse because it interferes with the flour’s hydration process. After the autolyse, I like to add a generous amount of salt—2 1/2 teaspoons of coarse kosher—because it gives the dough greater depth of flavor. Once I’ve added it to the mixer, I raise the speed to medium and knead the dough for about 10 minutes. 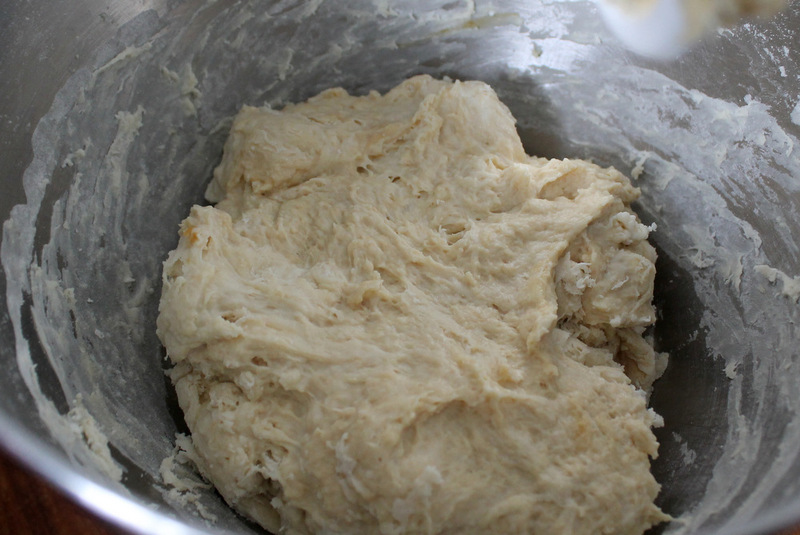 Since this dough is very stiff, it has a tendency to rock the mixer around, so don’t walk away. I like to keep my hand on the top of the mixer as it is kneading. Hanging out also gives me the opportunity to scrape the sides of the mixer bowl from time to time to ensure that the dough is kneading evenly. You’ll know that the dough is fully kneaded when it is stretchy, smooth, and no longer sticky. It should also pull away from the sides of the mixer bowl. 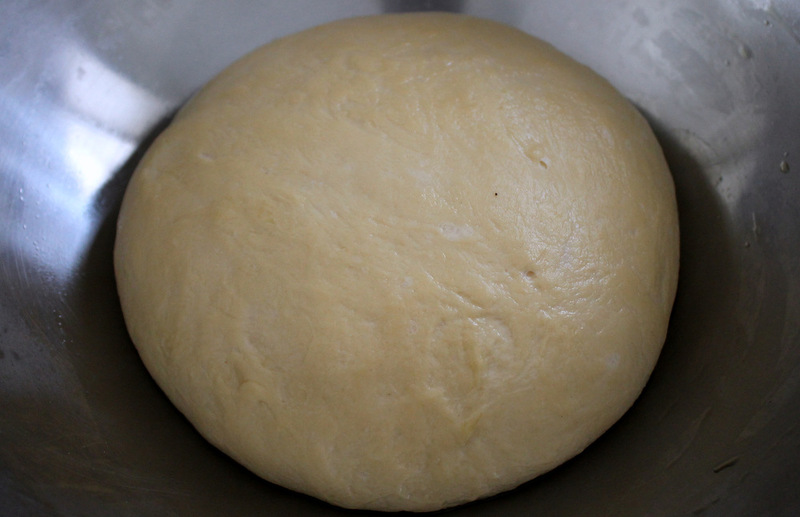 Dump the fully kneaded dough onto a clean countertop and roll it into a ball. It shouldn’t stick to the counter. Transfer the dough ball to a large, lightly greased mixing bowl. Lightly grease the top of the dough and cover the bowl with plastic wrap. Depending on my schedule, I’ll either let the dough rise on the counter until doubled or stick it in the fridge to rise more slowly. This stage will take around one hour on the counter (depending on the ambient temperature in the room) or 3 to 4 hours in the fridge. You could even let the dough sit longer in the fridge if needed. Now the dough is ready to be shaped. To ensure that the bagels bake evenly, I like to use a scale to divide the dough into six equal pieces. Simply weigh the entire round of dough, and then divide the total weight by six to get the weight for each bagel. My dough clocked in at 729 grams, so I weighed out about 121.5 grams per bagel. Use a bench scraper to cut the dough into neat pieces. Next, I pre-shape the bagels by rolling each piece into a ball. I let these balls rest for about 10 minutes, covered with a damp kitchen towel. Pre-shaping the dough will help the gluten relax and keep the bagels from totally snapping back when you try to shape them. There are a couple of ways to form bagels: the snake method and the (easier and more reliable) poke method. I go for easy and reliable. Simply use your thumb and index finger to poke a hole through the center of the dough ball. Then gently work all of your fingers into the hole to stretch it larger. 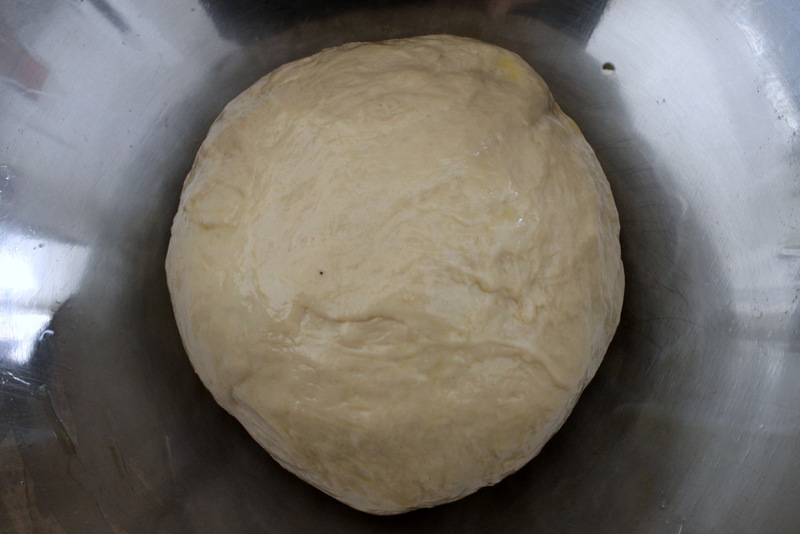 Continue to work with the dough until you’ve stretched the hole to about 2 inches in diameter. It’ll shrink upon proofing and baking, so you want to make the hole extra big. Place the shaped bagels onto an oiled parchment-lined baking sheet and brush each bagel with a bit of olive oil. Once all of the bagels are shaped, they need to proof. I like to let this step happen slowly in the refrigerator. While not totally necessary, this slow, extended proof develops subtle fermented flavor in the dough. At lower temperatures, yeast produces less carbon dioxide and more of the positive flavor components of fermentation, like sugars and acids. 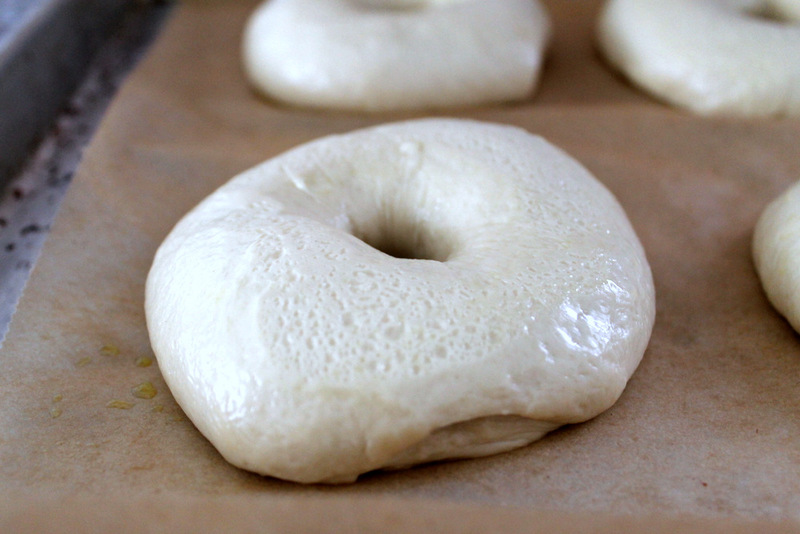 Plus, the bubbles formed by the yeast are smaller at a lower temperature, leading to a more compact bagel. (No one wants a fluffy light bagel!) I give my bagels around 12 hours in the fridge. This usually works out to an overnight proof. 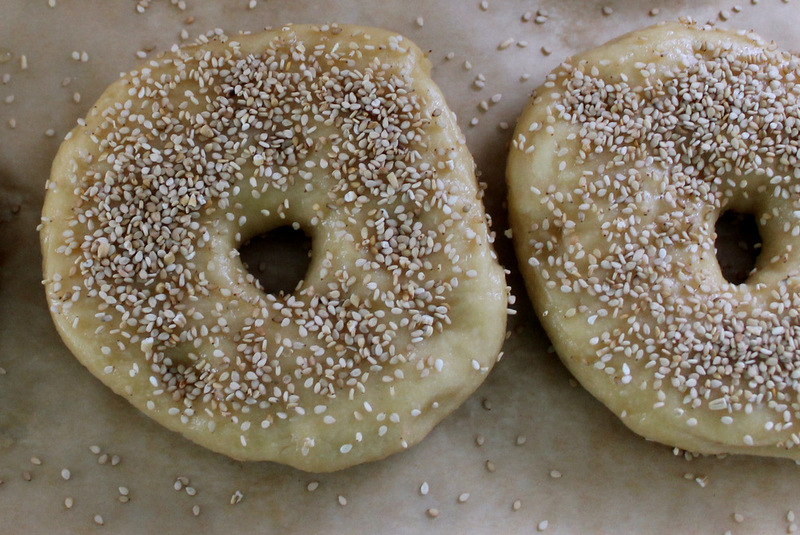 It’s actually perfect timing—the bagels will be ready to eat for brunch the next morning. 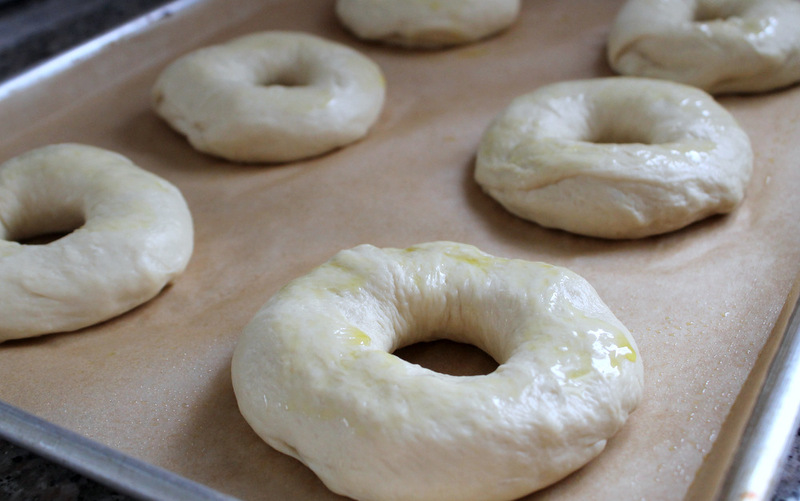 You’ll want to let the cold, proofed bagels warm up a bit before cooking. I take them out of the fridge about one hour before I plan to stick them in the oven. This is also a good time to turn on the oven. I bake my bagels at a flaming hot 500 degrees, and the oven needs extra time to get its temperature up that high and to remain consistent. Next, I prepare my boiling water bath. I bring a big pot of water to a boil over high heat and then reduce the heat to maintain a gentle simmer. Then in goes some more barley malt syrup (for color and flavor) and baking soda. The baking soda alkalizes the water, giving the boiled bagels a crisper, browner crust. I can fit three bagels in my pot. You may be able to fit more or less, just keep in mind that you don’t want to crowd the pot too much. Boil the bagels for about one minute on each side. You’ll notice that the bagels will puff and then deflate a little in the water. That’s perfectly normal. The bagels will also take on a yellow-ish hue. Again, normal. 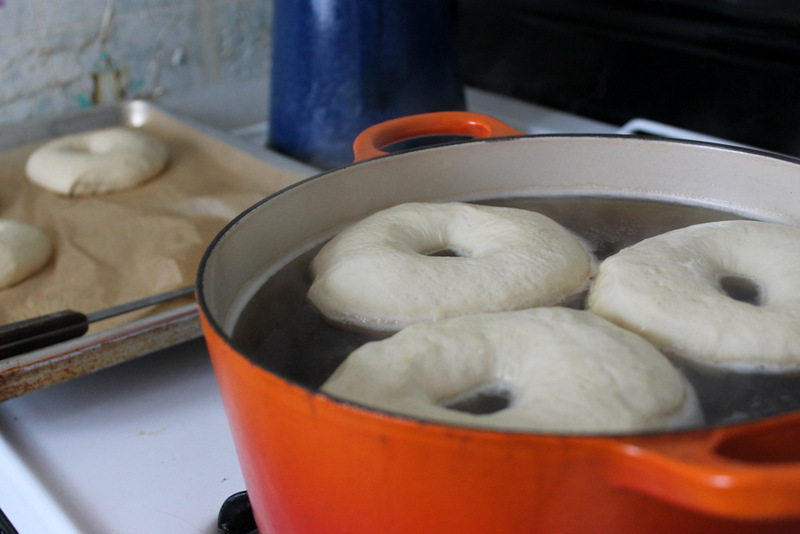 Transfer the boiled bagels back to the parchment-lined baking sheet, letting any water drip off back into the pot. While they’re still wet, sprinkle with any bagel topping you’d like. I’m a big fan of sesame seed bagels, so that’s what I’ve used here. Finally (finally!) bake the bagels. Place the tray in the super hot oven and let the bagels bake until they’re deep golden brown and have formed a crisp skin. It’ll take about 20 minutes. Rotate the tray after about 10 minutes to make sure everything is baking evenly. Check on the bagels after about 15 minutes to make sure the bottoms aren’t getting too dark. If that’s the case, stack another baking sheet under the first one. You’ll want to let the baked bagels cool completely before slicing in. I know that sounds like an exercise in exhausting impatience, but keep in mind the fact that the steam trapped inside the crisp exterior will continue to “bake” on the bagels, even after they’ve been pulled from the oven. They will be gummy while still hot. Don’t worry too much—cooling only takes around 20 minutes. Now, dig in! The bagels are best that morning; so don’t hesitate to indulge in a couple, or three, or four. Note: Dough recipe can be doubled to make 12 bagels. You will need two baking sheets. The ingredients for the boiling water bath do not need to be doubled. You can find barley malt syrup at high-end grocery stores like Whole Foods or at brewery supply stores. If using a stand mixer, combine flour, lukewarm water, 1 tablespoon malt syrup, and yeast in mixer bowl. Attach to mixer fitted with dough attachment. Knead on low speed until a shaggy dough forms, 2 to 3 minutes. Let dough rest, covered with a damp kitchen towel, for 10 minutes. Add salt to the dough and knead on medium speed until the dough is elastic, pulls away from the sides of the mixer bowl, and is no longer sticky when touched, 7 to 10 minutes. Transfer the dough to a clean counter and shape into a ball. Place in a lightly oiled large bowl, cover with plastic wrap, and let rise for 1 hour at room temperature or up to 4 hours in the refrigerator. The dough should have doubled in size. If kneading by hand, combine flour, lukewarm water, 1 tablespoon malt syrup, and yeast in a large mixing bowl. Use your fingers to bring the ingredients together into a shaggy dough. Let dough rest, covered with a damp kitchen towel, for 10 minutes. Add salt to the dough and knead together. Transfer the dough to a very lightly floured counter and knead until the dough is elastic and no longer sticky when touched, 10 to 15 minutes. Shape dough into a ball. Place in a lightly oiled large bowl, cover with plastic wrap, and let rise for 1 hour at room temperature or up to 4 hours in the refrigerator. The dough should have doubled in size. Meanwhile, lightly oil a parchment-lined baking sheet with olive oil or spray it with nonstick cooking spray. 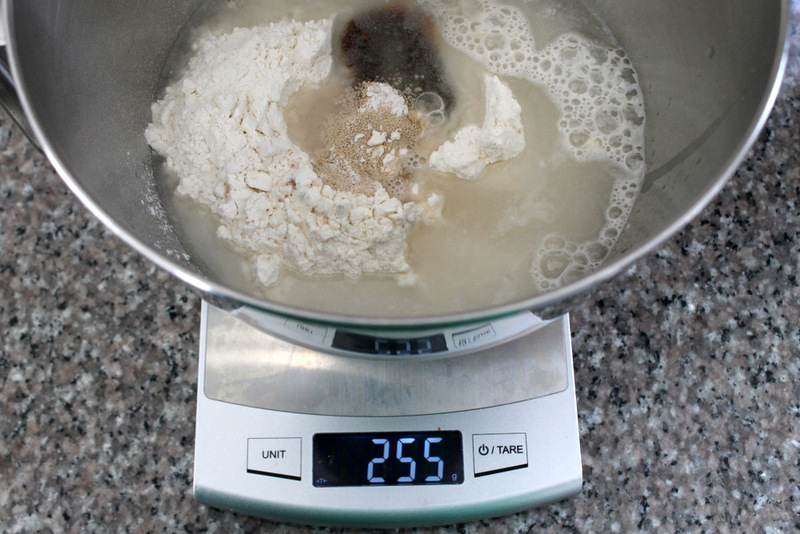 Once dough has risen, weigh it on a kitchen scale. Divide the total weight by 6 to get the ideal weight for each bagel. Divide the dough into 6 equally-sized pieces using the scale. Pre-shape the bagels by rolling each piece into a taut ball. Let rest, covered with a damp kitchen towel, for 10 minutes. 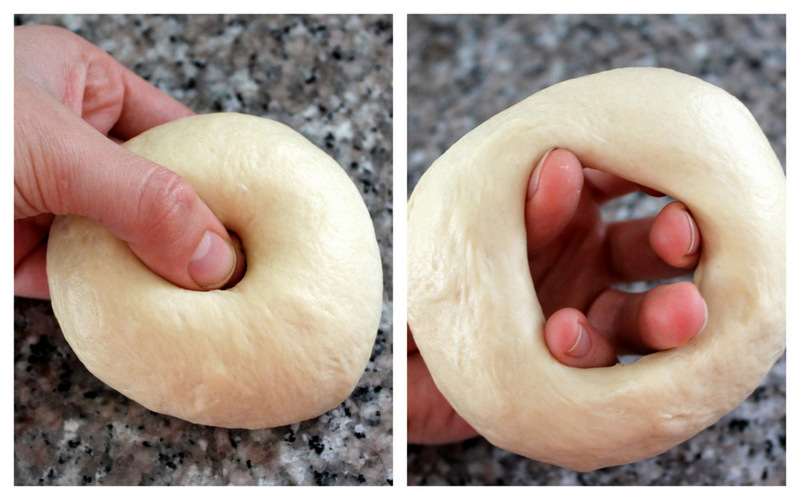 To form the bagels, use your thumb and index finger poke a hole all the way through in the center of each dough ball. Gently work all of your fingers into the hole, stretching it to form a larger hole, about 2 inches in diameter. Place the shaped bagels onto the prepared baking sheet. Once all of the bagels are shaped, gently brush with olive oil or spray with nonstick cooking spray. Cover bagels with plastic wrap, and place in the refrigerator to proof for 8 to 12 hours (an overnight proof works best for most schedules). The next morning, remove bagels from the fridge about 1 hour before you’d like to bake them. Preheat the oven to 500 degrees. When you’re ready to bake, fill a large, wide pot with water to a depth of about 4 inches. Bring the water to a rolling boil, and then reduce the heat to maintain a simmer. Add the remaining 1 1/2 tablespoons barley malt syrup and the baking soda. Stir gently to dissolve the syrup. Gently place proofed bagels into the simmering water bath. Three to 4 bagels should fit comfortably in most pots. Simmer bagels for 1 minute on each side and then remove from the water bath with a slotted spoon. Return to parchment-lined baking sheet. Continue with remaining bagels. While bagels are still wet, sprinkle with desired toppings. Bake bagels in the oven until deeply browned and crisp, about 20 minutes, rotating the baking sheet halfway through the cooking time. If it seems that the bagels are browning too much on the bottom, stack another baking sheet underneath. Let bagels cool completely before slicing and serving. Bagels are best the day they are made, but will keep for a couple of days in an airtight container. Leftover bagels are best toasted.